On December 10th, we celebrate Human Rights Day in order “to bring to the attention of ‘people of the world’ the Universal Declaration of Human Rights (UDHR) as the common standard of achievement for all peoples and all nations” (UN General Assembly, 1950). Adopted on 10 December 1948, the UDHR is the first international document, which formally sets out fundamental human rights to be universally protected. After the adoption of the UDHR, the right to education has been reaffirmed and further developed in a number of international and regional treaties. 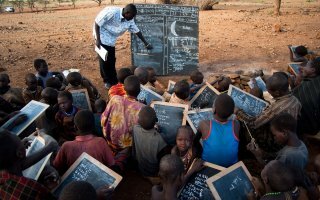 Today, all States (except South Sudan) have ratified at least one human rights treaty, accepting the legal obligation to respect, protect and fulfil the right to education for all, without discrimination. However, there are still huge challenges in fully realising the right to education. Everyday, everywhere in the world, this right is violated. As we celebrate Human Rights Day, it is important to remember that the right to education is more than words written in legal instruments. The law is fundamental in guaranteeing the right to education, but the law alone does not mean everyone is enjoying their universal human right to education. I recently attended the World Forum on Human Rights, held in Marrakech from 27 to 30 November, where I presented on the state of the right to education in the world during the education session, giving an overview of international and national law, as well as flagging the on-going issues in practice, such as: non-access and discrimination against marginalised groups, the violation of free education due to the levying of indirect costs and fees, bad quality education, and lack of financing linked to the growth of privatisation in education. Colleagues from different regions of the world were also raising key issues. Beatriz Pérez, from the Bolivian Campaign for the Right to Education, focused on gender inequality and the importance of quality education, which should promote dignity. Rene Raya, from the Asia South Pacific Association for Basic and Adult Education (ASPBAE), highlighted that Asia-Pacific hosts the majority of illiterate adults (64% of global total) and 31% of total of out-of-school children. In the region, over 100 million youth (15-24 years) have not completed primary education and gender disparity remains large with 2/3 of women illiterate and more girls out-of-school than boys. At the same time, Asia-Pacific spends the least on education, which explains why the right to education is not realised in practice, despite most countries having constitutional and legal provisions guaranteeing free and compulsory education. Rene noted, that in recent years, due to the lack of public financing, Asia-Pacific has seen a stronger push towards privatisation with an increase in private school enrolment, the rise of low fee private schools, the expansion of private tutoring, and the emergence of corporate chain schools, which all negatively impact on the enjoyment of the right to education. In Cambodia for instance, private tutoring has become so widespread that poor students, whose parents cannot afford it, fall behind. Privatisation doesn’t just affect students; teachers working in private school are paid extremely low salaries, often without benefits or social security. Refaat Sabah from the Arabic Campaign for Education for All (ACEA), reiterated the importance of teachers’ salaries for a good quality education, and firmly denounced the money spent on buying arms rather than using it to protect the right to education of everyone. He told us the stories of Palestinian students who have been shot on their way to school reminding us that in some parts of the world, particularly in emergency contexts, students risk their lives to access education. A few moments later, Alberto Croce, from the Argentinian Campaign for the Right to Education (CADE) stood up and asked for solidarity for the 43 missing Mexican students who disappeared two months ago while they were demonstrating against the Mexican Government’s plan to reduce education budgets. What happened next moved me a lot. We opened the floor for questions and many hands shot up – too many to count. The room was packed and I had the impression that everyone wanted to speak. About 15 people were able to take the floor, and each of them had their own personal story to tell. Almost all of them highlighted discrimination issues: the lack of access to early childhood care and education in rural area, particularly for poor families; the lack of access to school for disabled children, even more so if they are orphans; the challenge for nomadic people to get to schools as the availability of mobile schools is limited; the exclusion from education of persons in detention; the gender inequalities from primary to higher education; and the difficulty in receiving education in minority languages. They also raised quality issues, for instance, in some remote areas students are taught in tents, and materials, such as books, are unavailable. Students also denounced the prohibitively high university fees. Nothing of what I heard from them was new to me. I know these realities. But nonetheless I was deeply moved by people’s need to express them. Many participants came to me after the session to ask for more information and continue talking about the challenges they face in their particular context. It reiterated to me that, for these people, the right to education is more than just words written in legal instruments. It is a daily challenge to effectively enjoy it. It is essential to create more spaces where people can be heard and find support in their fight for the full realisation of their right to education. On the Right to Education Project website, we have a multilingual discussion forum and a blog where I encourage everyone to share their stories. This space is yours. And if you need any information or support, do get in touch with us. This year, the Human Rights Day’s slogan, ‘Human Rights 365’, encompasses the idea that every day is Human Rights Day. It celebrates the fundamental proposition in the Universal Declaration that each one of us, everywhere, at all times is entitled to the full range of human rights. Today, let’s call on States to comply with their obligation to guarantee the right to education to everyone, including through the adoption of special measures towards marginalised groups. No one can be left behind. It is essential for the well-being and development of each individual, as well as for society, that everyone can access and receive an good quality education. This post has been written orginally for INEE's blog. You can also find the text on their website. Delphine Dorsi is Legal and Communication Officer for the Right to Education Project since September 2012. Prior to this position she worked at UNESCO for the Right to Education Programme where she carried out research, produced publications and monitored the implementation of the right to education, in close collaboration with UN treaty bodies and the UN Special Rapporteur on the Right to Education. She also worked with a number of NGOs in Europe and Africa. She holds a Master Degree in Human Rights from the University of Strasbourg.